The new bill has more security features then before, including the 3-D security ribbon and the bell in the inkwell which changes color from copper to green when the note is tilted, an effect that makes it seem to appear and disappear within the copper inkwell. The new design for the $100 bill keeps three security features from the previous design: the portrait watermark of Benjamin Franklin, the security thread and the color-shifting numeral 100. 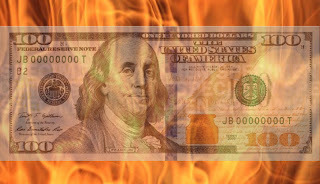 The newest, ultimate security measure used by the U.S Department of the Treasury to protect their flagship banknote is unique and infallible. They are unprintable! A Treasury spokesman sheepishly joked, "If we can't print them, then how are the counterfeiters going to do it?" Approximately 1.1 billion bills worth $110 billion dollars were printed with an estimated 30% failure rate due to “the paper creasing” leaving a blank, unprinted area on the face of the note. Each bill cost 12 cents to print, so that's about $120 million wasted spent, even before the costs to sort the good bills from the bad bills are added in. It is estimated that filtering out the flawed bills by hand would take 20-30 years, but an expensive mechanical solution could do it in 1 year. And what happens to all the misprinted bills when they have been separated from the good ones? They get burned, long before anyone gets the chance to roll one up and snort coke through it. WTF? - The New Penny a story about the new penny. 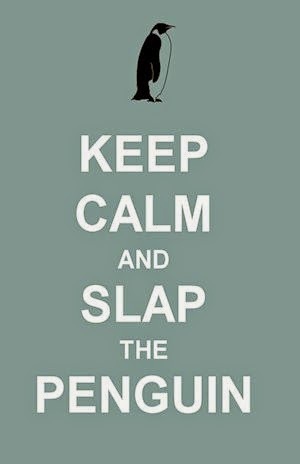 *Slap the Penguin in no way condones the forging or unlawful printing/sharing/copying of banknotes. I wonder if all this is necessary. What really gets me is all the new backs on coins? WTF? How much is that little gimmick costing us taxpayers? I guess it takes peoples minds off the real problems! I agree Jeff, did you click the link to WTF? - The New Penny. I rant about just that.